It is believed that the game of Bowls originated in Ancient Egypt as artefacts found in tombs shows a game of skittles with round stones played in 5,000BC. Others suggest that Bowls was spread across Europe and the Roman Empire by the Roman soldiers who played a game which involved tossing a stone towards a target, with the object to get as close as possible.. Balls that were rolled rather than being thrown gradually replaced the stones. The sport spread across the world and took on a variety of forms, Bocce (Italian), Bolla (Saxon), Bolle (Danish), Boules (French) and Ula Maika (Polynesian). The oldest Bowling Green still played on is in Southampton, where records show that the green has been in operation since 1299 A.D.
From the time of Edward III the game was restricted by royal decree to “Noblemen and others having manors or lands”. The ban was lifted but quickly reinstated when gambling became a major attraction within the game. 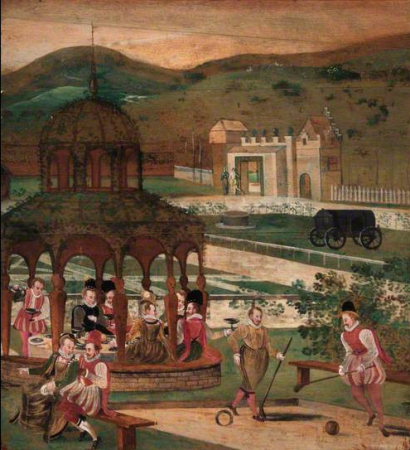 King Henry VIII banned the sport for those who were not wealthy or “well to do” because “Bowyers, Fletchers, Stringers and Arrowhead makers” were spending more time at recreational events such as bowls instead of practising their trade to help the war effort. Henry VIII ensured it was a game of the rich, by requesting that anybody who wished to keep a green pay a fee of 100 pounds and the green could only be used for private play. He forbade anyone to “play at any bowle or bowles in open space out of his own garden or orchard”. However, bowling carried on in the face of fines and prison, with bowling alleys popping up everywhere, and it was only in 1845 that the statute was repealed. A bowling green has been a permanent fixture at Windsor Castle. Anne Boleyn was a bowler, as were many noblewomen, including Elizabeth I and Queen Victoria. The most famous game of bowls.. Certainly the most famous story in lawn bowls is with Sir Frances Drake and the Spanish Armada. On July 18, 1588, Drake was involved in a game at Plymouth Hoe when he was notified that the Spanish Armada was approaching. His immortalised response was that “We still have time to finish the game and to thrash the Spaniards, too.” He then proceeded to finish the match, before embarking on the fight with the Armada, which he won. 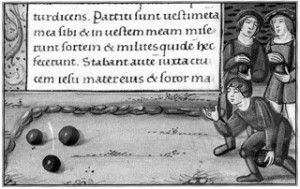 Throughout the Tudor Period bowls was very a popular sport, fortunes were won and lost gambling on games and bowling featured in many of Shakespeare’s plays. In “Troilus and Cressida ” (iii. 2), Pandarus says: “So, so; rub on, and kiss the mistress” A bowl that kisses the jack, or “mistress”, is in the most advantageous position, so “to kiss the jack” suggests a state of great advantage. In “Cymbeline” (ii. i), Cloten exclaims, “Was there ever man had such luck! when I kissed the jack, upon an up-cast to be hit away! I had a hundred pound on’t.” A hundred pounds would have been worth around £45,000 in today’s money! The proverb “To run against the bias,” when someone departs from the natural course, and the modern use of the word biased, came from bowling where the bias is the natural course for the bowl. The name ‘jack’ is derived from the Latin word jactus, meaning a cast or a throw. Casting of stones translates in Latin as “jactu lapidum” and was a game in which rounded stones were thrown at, or bowled towards a target object and it is believed that the modern word ‘Jack’ comes from this term.